Splash pages, you gotta love 'em. A blank canvas where the artist can hit you with a large dose of illustrated 'wow'. This week, a Frank Quitely drawn number from the Offspring one-shot, part of DC's Kingdom event. Living proof that despite while the whole thing was written by Kingdom Come co-creator Mark Waid, the two bookends were a dog's breakfast compared to the one-shots in between - Offspring, Planet Krypton and Kid Flash especially. Here Waid and Quitely pull off a massive father/son moment that serves as a reaffirming moment in the lives of two great malleable characters. 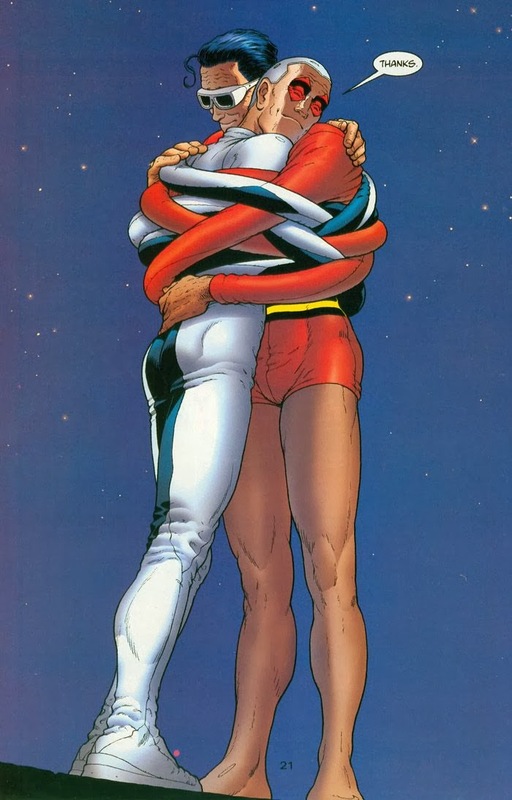 While similar beats would later be explored in writer Joe Kelly's run on JLA, everytime I look at this splash I hear a little 'awww' a lot of 'wow' and my fingers cross that Frank will touch the real Plas again - in one reality or another. That really is a nice and sweet splash page. Probably should've saved it for Father's Day, but a true tender moment nonetheless. How can you not love that Frank Quitely art? Damn, makes we really wish I had that DCUC Plastic Man figure now. Or at least a Plas Mego so he could bend in every way possible. This was the first place I saw Frank's art - instantly addicted in one issue. Frank Quitely is SO damn good. Love this. -Plas is a favorite... I has feels. Yeah - and a guy missed from comics. Which is odd considering he was riding quite high for a while there!